Chrysler is once again capitalizing on the longstanding cliché that pickup shoppers are the type to consider hunting camo appropriate adornment for any occasion. While it might be hard for deer to see, you can rest assured this Mossy Oak edition 1500 pickup will stand out to other humans like a row of NRA and "Terrorist Hunting Permit" stickers. The package takes the already established Outdoorsman trim level, adds some Break-Up Infiniti camouflage (yep, I know what it's called), Mossy Oak-logo seat embroidery, and fancy lacquered wood interior trim pieces. The Outdoorsman has upgraded shocks, a towing package, body kit, and lockable waterproof storage bins along the gunwales of the bed called "Ram boxes" over the standard Ram. Ram has had a partnership with Mossy Oak since 2011. In the words of Ram president and CEO Reid Bigland; "Our Ram Truck owners are passionate about hunting and fishing. The Ram Mossy Oak Edition gives hunting enthusiasts a way to proudly proclaim their love for the outdoors." Well, he's not wrong... yet no mention of stealth benefits. If there's anything I don't want to deer to see, it's the bottom fifth of my pickup. Joking aside those Espresso-Tuscany Katzkin seats look like a nice place to warm the buttocks after a long day in a deer stand, and people who have driven the Outdoorsman seem to like it. 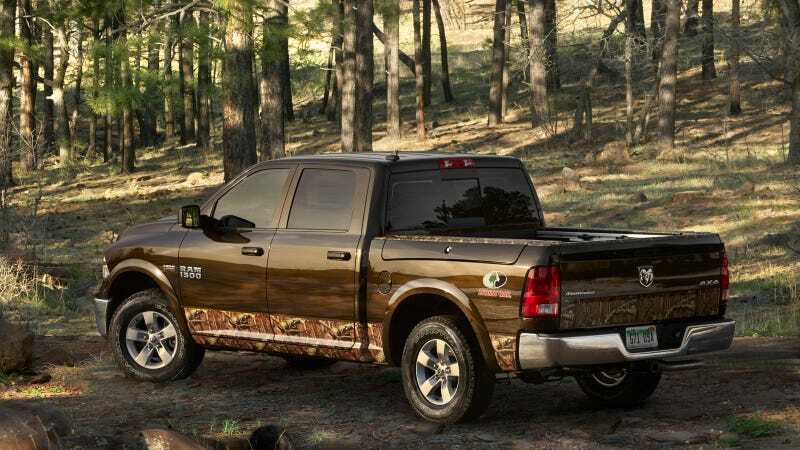 I'd love to hear what real hunters think of this offering, and how many would spring for it over buying a regular Ram and picking up their own camo wrap at Wal-Mart.